Delicious wholesome oaty snacks with sunflower, pumpkin & chia seeds. Flahavan's Flapjacks are deliciously oaty snacks for all to enjoy. Oats have long been recognised for their health benefits and all of our Flahavan's Flapjacks provide you with a source of fibre. Have you tried our other delicious varieties? 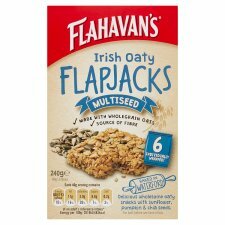 If this product should fall below the high quality that you associate with Flahavan's, please return the box and contents to the Customer Service Manager at the address below, stating when and where it was purchased, or email your query to customerservices@flahavans.ie. This guarantee does not affect your statutory rights. For best before see base of box.